Hydrangea macrophylla ‘Endless Summer’ delights endlessly! Plant type: An ornamental shrub, native to Japan and Korea. 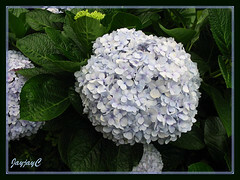 It’s a species of Hydrangea widely cultivated and naturalized worldwide in temperate and compatible climates. Light: Part sun to light shade. Prefers morning sun and afternoon shade as plant will wilt in the hot sun. Soil: Moist but well drained. Ideally light, loamy, acidic and enriched with organic matter. Propagation: Easily from stem cuttings or ground layering. Let Judith King, a member of the American Hydrangea Society teach you how to! Can also be propagated by dividing the clumps of old established shrub with a shovel. 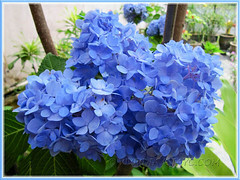 Features: Hydrangea macrophylla ‘Endless Summer’ is a mophead type hydrangea with a delightful solid mass of sterile flowers, different from the Lacecap Hydrangea (Hydrangea macrophylla normalis) which has a center of non-showy fertile flowers surrounded with an outer circle of sterile showy flowers. It is a spectacular deciduous shrub with a rounded habit growing 1-2 meters tall and as wide with huge ball shaped flower clusters (13-20 cm. across) at stem tips! These mophead blooms can be pink, blue or lavender, depending on the soil pH and maturity. Foliage is luxuriant with medium to dark green leaves measuring 7-20 cm long that are opposite, ovate and serrated. Endless Summer Hydrangea is unique and keenly sought after! It is the first Hydrangea macrophylla that flowers on both new and old wood, thus extending color virtually throughout the season, delighting endlessly with repeat blooming! Care: For best growth and blooms, plant the Hydrangea macrophylla ‘Endless Summer’ where it can enjoy morning sunlight with afternoon shade and keep soil evenly moist. Do not locate it at hot, dry and exposed areas where it’ll be roasted! Since it blooms on new growth, always deadhead to promote repeat bloom! Prune the bush only to remove dead wood or to shape the plant after it has bloomed. It’s quite an easy to grow plant with a moderate growth rate. These Mophead Hydrangea can change the color of their flowers, depending on the soil pH. Blue flowers turn pink in alkaline soil which has dolomitic lime added and pink flowers change to blue in acidic soil which has aluminium sulfate added to it. 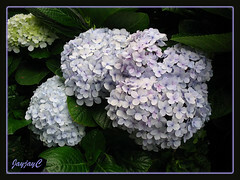 An interesting read about hydrangea color change here! Usage: This versatile Endless Summer Hydrangea will make a superb shrub for accent, specimen or perennial border. Great for container gardening or use as patio/deck container plant to brighten sites with its luxuriant foliage and voluptuous flower clusters! This consistent bloomer will be perfect too for adding colors to shady areas of cottage or woodland garden. Freshly cut blooms can be used in vases or bouquets, and even dried for floral arrangements and wreaths! For sub-tropical & temperate regions: Check at Endless Summer Collection’s site to get excellent info for Hydrangea care and growing tips, as well as tips for blooming success. Explore its how-to videos for more! A dream wish comes true! We’ve always wish to have hydrangeas in our garden, having first viewed these gorgeous blooms during our honeymoon at Penang Hill Resort many decades ago! But had the wrong notion that they can thrive only at our highlands which have compatible cool temperate climate! Then, one fine morning late last year, a very close friend surprised us with a wonderful gift of 3 newly rooted hydrangea cuttings (6-8ins. tall) in a pot and told us that it’s possible to grow them in our hot lowlands (average 30 degrees C), but locate them at filtered sunny areas. Wow! What great news! In our tropical heat though, these Hydrangeas do droop from midday onwards but bounce happily back when it’s cooler in the evenings. However, I did wonder why the differences in flower color tones as both cuttings were from the same parent plant! The only change made was we transplanted them after the first flowering into a larger pot and filled up with additional soil. I gather this proves correct what I’ve just read from the internet that Hydrangeas often change color on their own when they are planted or transplanted. They are adjusting to the new environment. I just can’t wait to propagate more plants from cuttings! Keeping my fingers crossed though that a stem cutting taken from our first flowering hydrangea plant last Sunday, then divided into two cuttings and push into soil will survive! Hooray! Propagation by stem cuttings is a success and the two young plants are thriving well. 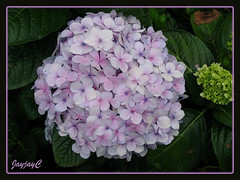 Meanwhile, here is sharing some recent images of more hydrangea blooms from our garden. Hmm…the newer ‘mopheads’ are seen to be larger as the plant continues to mature in height and bush size with new stems. The bloom clusters captured in November 2, 2007 as shown in the right image measures about 9 inches across! How awesome! Photos below were captured in March, just to share how lovely the hydrangea shrubs are thriving in our tropical garden… more than 4 years old and they’re still going strong!! Brunfelsia pauciflora (B. calycina) – a glorious tricolor beauty! Happy CNY to you & your loved ones. Hope you had a lovely celebration. I recently bought the hydrangea for CNY. The flowers were light pink but mostly light green. I thought the green will eventually change to pink but it hasn’t. Also the end of the leaves now start to curl & turn brown. It is placed at the porch with no direct sunlight at all. Can you advise me what’s wrong. If I want to add alum sulphate to change the soil ph, can I add during the blooming period or wait after. Also, I have a calathea plant, I think it’s the makoyana type. My problem is that the burgundy colour on the overleaf is disappearing for the new growth and the leaf size is getting smaller. Sorry for the long queries. Thanks for the season’s greetings, YenLing! Gong Xi Fa Chai and a very joyful and prosperous new year, with an abundance of everything good to you and yours too. Hope you’re having a wonderful CNY celebration with family, relatives and friends, as we did! 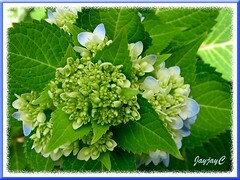 About your hydrangea – I’m surprised that the green buds did not mature to the color of its florets! I’m wondering whether the plant’s energy was utilized to adjust to its new environment, more so if it was previously at a cooler and shadier location? Our hot and dry season for the whole month of January with the exception of some rainy days since the last week could have been the culprit in shriveling the leaves. Hydrangeas need high humidity, so it is advisable to mist the leaves during such dry periods in the early morning so that they can withstand the heat and dryness during the day. We’ve never tried changing the color of our hydrangeas. If you’re serious, do follow this link which has given an extensive guide on its color-changing process – seems to indicate that the application be made as soon as the flower buds are evident. About your calathea, I’m just guessing that it is probably too early to see it as a problem. Probably, that’s the growing process…wait and see them maturing first. Sorry that I’m unable to give you a definite answer. Thanks so much for your reply. Really appreciate it. Sorry, we will not disclose our address. Suffice to know that we live in Kuala Lumpur, Malaysia and our plants are home-grown for our own gardening pleasure, neither for sale nor exchange. Just drop in to tell you that my hydrangea has finally all turn pink. It’s so beautiful and healthy now and am so pleased. Have also sprout new shoots. I’ve been watering it with my fish pond water – must have done the trick ! I so happy for you, YenLing! 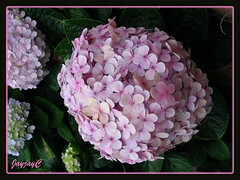 I can just picture how beautiful they appear as I’ve just seen a lovely pink hydrangea at a nursery last Sunday. 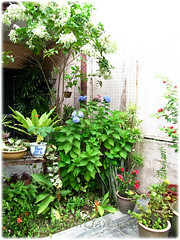 You’re right about using fish pond/tank water – I’ve read that plants and veggie just love it as it acts as a fertilizer. Wishing you more gorgeous blooms ahead! Hydrangeas are such prolific bloomers, when provided the right culture. What a lovely flowers! I can’t help but to admire the color of it. It’s so unique. Jacq, keep on. Hope to see more of its kind here in my next visit. Thanks! Hi Jacq, thanks for providing such interesting reading about your plants. I bought a hydrangea plant a month ago, and it was in full bloom. Some of the florets have since browned, and I had cut those off. There are lots of new leaves appearing, but no new flower buds. I wonder when I should expect to see new blooms appearing, ie, does the plant constantly bloom all year around, or do I have to wait a few months between each bloom? Is there anything I should do to get them flowering continuously? Our pleasure really, Yeng Yun! Since blooms will appear only on new growth at stem tips, it is recommended to deadhead (remove the spent flower head) by cutting back the stem much lower to your desired height to promote bushiness with new stem growth and hence more blooms. You can then use the stem cutting which root easily to propagate new plants. Repeat the process after each flowering and you’ll eventually get a lovely bushy shrub that will reward you with endless blooms year round. 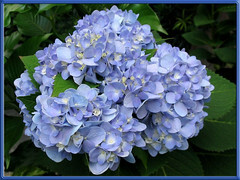 As with all plants, hydrangea too enjoy being fed with a balanced fertilizer, once fortnightly or monthly. Everyone is looking for the unusually coloured plants. Well hydrangeas appear to be suited to accepting any colour. I can produce any colour hydrangea you would like. Yellow, purple, orange, crimson, blue, pink etc. Disolve any colour of artist acrylic paint [available at an art store not home depot] in water, put it in a spray bottle and spray your white annabelle hydrangea flower. Presto, orange flowers. Repeat applications deepen the colour. And it does not wash off in the rain, does not appear to harm the plant. Gives you a very unusally coloured flower. But this is cheating. Thanks for your wonderful detail information on plants. You often mentioned about balanced fertiliser, can you explain more about it. I had recently applied a flowering fertiliser and it had burned my plants, so I’m really not sure what to do to reverse the damage. We typically mention the usage of balanced fertilizer in general. Plant feeding is very subjective as every gardener has his/her own favorite brand/kind of fertilizer and feeding schedule differ between one person and another, so too climatic conditions affect the need or frequency of fertilizing. Ground-grown or potted plants have different needs too. Sometimes, one just need to experiment to know what would be best for plants in your own garden. If your plants were burnt as a result of fertilizing, probably you’ve either applied too much, too frequent or too near the crown of the plants. It’s normally safer to use at half the strength recommended on the packet and always apply a few inches away from the central trunk/stem as some plants have very fragile root-system. I realise my mistake as I have applied it on the crown of the plant and got the whole thing burnt. You’re most welcome, James…glad to have been of help. I have just bought a pot of pink hydrangeas from a local nursery and was wondering if your blue Hydrangeas are still blooming or surviving the tropical heat. Hope to get some tips from you on taking care of them. Sorry for the late response, Raymond! Yes, our Hydrangeas are growing fine and blooming well. They seem to thrive well in bright location, but not direct sun. Best with filtered sunlight, good fertile soil that holds moisture yet drain well, and lots of water. During very hot seasons, best to water twice daily, ie. in the early mornings and late afternoons, but on rainy seasons once on every other day suffice. Fortunately our White Mussaenda tree had grown taller and providing them some shade. Have a peep at our garden last November to see their general health. Frankly, they’re such easy-to-care beauties…we just love them! May your pink hydrangeas delight you with prolific blooming year round, Raymond! 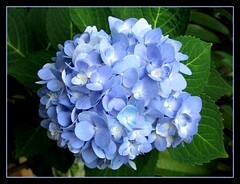 u know lot about hydrangeas .iam from india . Nature has gifted Bangalore city with a very pleasant and moderate climate. In Bangalore, neither would you tremble with cold in winters, nor would you drench with sweat in summers. Bangalore weather boasts of cool winters and warm summers, without any extremes in both the cases. In this article, we have provided information about the weather of Bangalore. Read on to explore Bangalore weather and climate further. As per Bangalore weather, the summer season lasts from April to June. The maximum temperature during the day rarely exceeds 33 deg C, making the summers quite mild. Winter season in Bangalore stretches on from December to February. The minimum temperature in winters hovers somewhere around 10 deg C, with the coldest month being January. Early morning fog can also be experienced during December and January. The monsoon season in Bangalore is from June to August. The southwestern monsoon rains drenches the city in monsoons, taking the humidity to as high as 76 percent. The city of Bangalore counts amongst the few cities in India that experience an agreeable weather throughout the year. 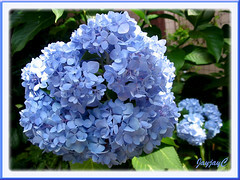 Still, the best time to visit the garden city of India is between October and February.so accordin tto this climatic conditions how to care for hydrangea when to prune it and when to propagate it and when to fertilize it.and when to remove the flower or ( deadhead) it.i hope u will help me out . Hi f1laila! We’re in the Tropics. Since you’re in the temperate region, please refer to the 2 links I’ve provided in our article above at sub-header: For sub-tropical and temperate regions, where you can find useful and indepth answers to your questions. how ru.i want to mail u my hydrangea plant pic .if u dont mind can u send me ur email id.so that u will know at what progress my hydrangea plant is .i dono iam in love with hydrangeas and i wanna grow like how u do.so wanna learn lots and lots.so want to send before and after hydrangea pics. Sorry, f1laila….if you have any questions re hydrangeas, I’d advise you to refer them to the hydrangea experts for temperate growers at the links that I’ve provided above. I’ve mentioned before that we’re gardening in the tropics, which differs from your climate. Moreover, we’re not experts, just ordinary gardeners. So sorry, henceforth, I won’t entertain any more messages from you! 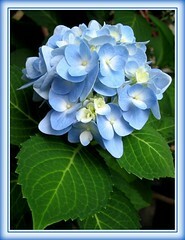 So happy to have found your site on ‘how to plant hydrangeas’ in the tropical weather like KL. I am also living in KL, and have been searching the internet for advice. I also recently purchased a pink mophead from Brinchang and am determine to learn how to care for it. It is for my mom who loves this plant. I originally put it under a tree for 2 weeks but read that it needs sunlight to produce more flowers, so i shifted it out of the shade. Flowers became more pink and bigger after that. Now, I noticed a lot of new leaves shoots but no flower buds. I read only the top will produce flowers. I wonder how to turn those tops into buds? Secondly, the blooms that existed when i purchased them is wilting soon. I plan to deadhead them. I notice new leaves stalks/ leaves coming out from below the blooms, about 3-4 inches. Do i deadhead blooms above the new leaves or below it ? Thank you very much. Looking forward for your reply. Lovely to ‘meet’ same city gal, CheenQuan! 1) Flower buds will emerge only at the terminal tip of matured stems. Thus, you simply have to allow the new shoots to mature before you can expect any blooms. 2) Just snip off the withered blooms but allow the new leaf stalks to flourish as more blooms may emerge at the tips. When all have completed their flowering, cut the main stem as far back as you’d want them off. Scrutinize our photos above and you can observe that sometimes the Hydrangea blooms appear as a mophead (one large cluster), yet others would have a few clusters on short stalks like what you may be experiencing on your plant. 3) Just imagine how you’d want your hydrangea shrub to appear. If you want your shrub to be bushy and branch out from the lower end, then just prune the stems that have finished flowering as low as possible (probably 6-10 inches off the ground). Each cut section will then sprout 2-3 new shoots that eventually mature to produce flowers. a) Cut each stem into 4-6 inches lengths, making sure that each length has at least one to two leaf node/joint. Remove the basal leaves and stick it into moist soil with the node just touching the surface and firm it. Place the pot at an indirect sunlit location and keep it moist. That’s it…simple and easy! need to know how to make hydrangea to bloom? Lynn, do check at Endless Summer Collection’s site for some blooming tips. 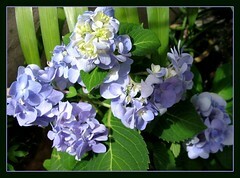 Just wondering if you know any places where I can buy hydrangea plants/ cuttings, esp in KL? Thanks for your kind comment on our plants, Jill! 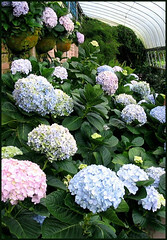 Re Hydrangea plants from cuttings, you can easily get them at most garden nurseries in KL. I’ve even seen them on sale at Tesco, Giant or Carrefour Stores. All the best and happy gardening! 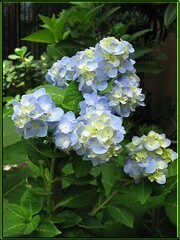 Thanks for sharing about your garden Hydrangea plants. I love the flowers especially the blue ones and have always wanted them in my garden but never thought that it could survive in our hot tropical weather (I live in Kelana Jaya, PJ). I think I’ll soon get me a couple of plants… Thanks again..
Our pleasure, Paul! Yes, the Blue Hydrangeas can thrive in our lowland heat but do get scorched if located under direct sunlight. Thanks, Norizan! Sorry, we’re unable to name the nurseries because we’ve never bought any Hydrangeas before. Our first plants started off years ago from 3 rooted hydrangea cuttings that were given to us by a dear friend in 2006. Since then we’ve successfully increased our numbers from stem cuttings which root easily. I’ve seen Hydrangeas being sold seasonally (especially during festive seasons) at nurseries and superstores like Tesco and Giant. Wish you all the best in your search, though. I live on a cliff about 40 feet above the ocean….Can I plant hydrangeas on the ocean side of the house? I have a perfect spot…morning sun afternoon shade…but the hydrangeas will get some salt spray….and ocean breezes. Do you have any idea if this will harm them? So sorry to disappoint you, Carol… we’re unable to assist you with your enquiries. I came across you site when I was looking for advice on growing hydrangeas in malaysia. I live in Shah Alam and just bought a hydrangea plant from sungai buloh. Can I just say that your flowers are beautiful!!!! And it has totally given me hope that just maybe my hydrangeas may survive in this hot climate! My most immediate problem is location to plant. I have planted the hydrangea below a huge ficus lyrata backing a picket fence which provides the shade from afternoon sun. But I am worried cause the picket fence provides shade from morning sun too… Also that the ficus will aggressively steal all the nutrients from my hydrangea…. Sorry to bother you with these questions..just got excited when I saw your success story.. Indeed Kavi, hydrangeas can thrive and bloom well in our lowlands. We’ve planted them since late 2006 and they’ve never failed to cheer us ever so frequently with their bountiful flowers ever since. Noticed that hydrangeas grow and flower better when planted in the ground than potted. And, they definitely need a sunny spot (i.e. receiving morning to noon sunshine, not harsh afternoon sun though) to perform well and bloom. So, a sunny location is paramount if you want to see luxuriant growth and enjoy their blooms. No compromise, in my humble opinion.